What is the dress/etiquette code in the Algarve? Do I need a handicap card? What will I need to present at the course to play? What happens if I cancel all or part of my party? How do I book a junior, what are the rules and costs? How do I know you exist? What is my security? Can I book Buggies/Power trolleys? Is my handicap too high? Can I book specials with you? Why should I pre book ? Can the golf times change after booking? Do I need a Buggy, what are the rules? Will a 'society' handicap suffice? What if it is raining and stormy? What if the course is unplayable? When do I get the vouchers? How do I get or return my hire car? How do the golf transfers operate? What Happens if I lose/forget my voucher? Dress code on all courses is collared shirt, tailored shorts and socks, long or short. You must also have soft spikes on all algarve course. They will fit these for a small fee. The general etiquette must be observed. If you are rowdy, disorderly, drunk, horsing around, or in any way blocking or holding up play, the marshals have the right to eject you immediately from the course without refund. If you are judged to be incapable of play for any reason at check in, you may also be ejected without refund. The course directors decision is final. Buggies usually cannot be booked or paid in advance, on many of the Algarve courses, except for ' Summer Specials' in July and August on some courses*, or in the event that you are handicapped ( with proof), we may try and request the course to reserve a buggy for you, at their discretion. We may be able to pre-reserve buggies for groups over 16 players or more, again depending on the course. There are some buggy rules on courses, especially where buggies can or cannot go.. please ask the starter for the local rules. The Royal Course insists that all players who are not members, have buggies when teeing of prior to 10.30 am. If you really need a buggy, then all we can suggest is that you turn up early at the desk, and pay the buggy as you arrive, to ensure that you are front of the queue when the buggies come in, as they are on a 'first come' basis. In some peak periods this may have to be 40 or 50 mins prior to your tee off time. There are always buggies for at least the first hour of play, so if you have a time prior to 08.30(peak) or 9.30 (winter) you will certainly get a buggy. The cost of buggies varies from year to year, course to course, and season to season. The average cost of buggies is 40 euros per buggy. Vale do Lobo charge 60 euros, and Victoria, currently 50 euros. We know that this is steep, and continue to nag the course managers to no avail! Some of the courses can be a bit hilly, and we would recommend that buggies be taken, ( see course info), some are relatively flat and are easily walkable. Manual Trolleys are available for about 5 euros on every course. Powered trolleys can be rented on some courses, or in advance for several days at a time, collected and delivered to the first and last course of play. Rates on application. The courses may have some onsite, but not all, better and safer to pre book. Some courses may charge for using your own equipment such as power trolleys or buggies. All courses have a handicap requirement, and may ask to see your cards on check in or during play. Each course has a different 'maximum' handicap, to allow play to run smoothly. Most courses do not ask for the card to be shown at check in, and only may ask if and when , there is a problem or complaint to the marshals, on the course. We take no responsibility for players who do not meet the handicap requirements of the courses..is is entirely up to you to ensure that you are 'legal' to play any courses. Penina Champion, Victoria Vilamoura, Old Course Vilamoura. Monte Rei, Faldo and O'Connors. If you do not have a card you will not be allowed to play on these courses! There are some courses which allow beginners on them unofficially, eg Salgados, Penina Academy (9 holes) , Vale do Milho ( 9 holes) Balaia (9 holes). On the 9 hole courses we do not book these, you can usually turn up for a game or practice. The others will almost always allow a beginner to play in the company of golfers with a handicap, so they can ensure that the play is not slowed. Juniors are accepted on many courses, and usually do not require a handicap, as long as they are with adult golfers. Some course ( Vilamoura eg) may have a minimum age 12years. The courses will usually take a society letter as proof of handicap, this is entirely up to the course. When booking a larger group in to the course, it is usually acceptable to have a letter from a club or society, with all the names of the goup, and their handicaps, this saves considerable time! Every club will have a driving range, professional who gives lessons, putting green, showers, changing rooms and restaurant and bar facilities. Some like the Victoria, have a 'free' driving range for players waiting, and you can line up like a pro on grass and fire off a few warm up balls! They usually rent golf clubs, sometimes shoes and socks, will sell balls, old and new, tees etc at the desk. Some clubs will have other facilities on course, such as sandwich wagons, toilets on course, but these vary so please enquire at the desk. Club hire can range from 15 euros per set per day to over 50 euros per set, so please check first. We rent clubs at the office ( collect and return to our office only) for 15 euros per set per day, discounted for more sets or longer periods. How /When do I get to the course? We suggest that you arrive at the course at least 20 mins prior to your tee time to allow time to check in and prepare. The courses all have yellowy/orange 'golf' signs as you get to the areas nearby, and Vilamoura has internal signs on each roundabout. Some of them can be a bit tricky to find, so we suggest that you ask in the hotel reception or local shop, for a (or the) 'Golf' map ( about 10 euros) which has the courses clearly marked on them. Our map is not detailed enough to get you to the courses, although we hope soon to have some print out instructions for each course. What do I present to Play? Generally all you will need is the voucher that has been sent to you, some courses (eg Victoria, Old Penina Champ.and others ) will require handicap certificates. If you have a PGA card, this will have to be shown to the check in desk. Juniors, buggies and trolleys, will be paid for directly at the check in desk. If the weather is really stormy and windy, and there is a lot of 'standing water' on the course, then the course will be closed for the day. You MUST be at reception , at the tee off time booked, to arrange a refund or 'rain check'. If you do not turn up you will NOT get any refund as it will be shown as a no show. They will try and re-schedule you, but if you cannot play ( ie they close the course...), then a full refund is normally made. Please ask reception to call us and confirm this and we will arrange a full refund by cheque or to your card, depending how you paid. We would note that this is only for one, maybe two days in the whole year..so you would have to be Really unlucky to catch this weather! BUT if they are sanding the greens, tining them, or have major course works, drainage problems etc etc which considerably disrupt or degrade the playing quality, then this is entirely up to you to negotiate with the desk, as to what refund, or restitution is made, and the courses decision is final. Usually there will only be one or two holes affected, and they will almost certainly not refund for this...but if other factors come into play, then please talk to reception or the course director. We reserve the right to charge minimum 20 euros per player for cancellation and alterations. The amount of refund from each course depends on their internal rules. We promise to use our best efforts to ensure that you receive the maximum refund available. This will depend on such diverse factors as , number of players, date of play, course booked, season of play, date of cancellation prior to play, and others. The general rule is that as long as we cancel smaller groups at least a week before, we will get a full refund. After that time, some courses may get sticky and not refund at all. We can issue a statement for your insurance company, in the case you have an insurance cover for holiday losses. eg If you are cancelling golf only, say for one player out of 4, and more than a week prior to play, we normally would not charge any fee against this, but if it is a hotel/golf/transfer package, there may be some charges to pay at our discretion. We try and use common sense and help our customers to get a maximum refund in every case. If it is a total cancellation, we reserve the right to charge a minimum fee of 20 euros per golfer booked, plus any fees that may be retained by the golf course. This will be looked at on a case to case basis, and you are welcome to call us and see, in general, what will be the situation if you had to cancel. Alterations are broadly similar, again we reserve the right to charge 20 euros per alteration after the deposit is paid, or the golf booked. If you wish to change courses, we can usually do this, at least a week prior, or in the unusual case that the course has works disprupting play. However, as we are aware that groups can alter and flow, we always suggest that group leaders book for a larger number, and reduce it to 'real' levels when the group has paid their deposits or balances. Also for minor changes such as flight times etc we will not normally charge anything. For smaller parties, we can usually 'add on' extra players for no fee at all, and, as long as you give us at least a weeks notice, we can cancel (or alter courses) for some or all of the party, usually with a full refund less 20 euros per player. We book 'Summer Specials' with some of the courses, these usually include two players and a buggy . The course also sells these on the desk at the same rate that we do, there is no discount on these, but we can book and hold the times in advance for you. Some of the courses will have their own specials, twilight, competitions, early bird, summertime, breakfast, etc etc. These are bookable only at the courses, and directly with them, usually on the day, as they use these to fill dead space very early or very late, and if the course is full.. they will not allow these to be sold. So although a good deal, you cannot usually pre book these, and we, as agents, do not book these for you. We consider these to be inflexible, not very good value, and not pre-bookable. Therefore we do not use them. These are sold by about half the Algarve courses, and are again used to fill up their own space on a 'late late' basis, as they are valid for a short period, and can only book the courses as from the 'first' course that you play..and are valid for a week, and have supplements to pay on most of the courses... If you use a calculator, they are very close to our rates , with the passport you will get what's left 'next week' when you arrive.. just what the courses need to fill up their late cancellations at unreasonable hours! Most of the courses will allow juniors to play.. always up to 16 years old, some other and Lisbon courses, may be up to 18 years old. Proof of age may be requested. If not produced you will pay the full desk adult rate. The junior will have their time/s reserved with the adults, who must always accompany them, but will usually be paid for at the desk on the day at the rate given. Vilamoura has set rates, and most other courses have rates set at 50% of the desk rate...but these can vary during the year. There may be a lower age limit, Vilamoura 12 yrs, and as long as the accompanying adults ensure that the game is not held up for any following players, you can take some young players onto any course. Juniors may not be allowed to drive buggies, please ask the starter. Usually the courses will allow a spouse to accompany a golfer, but they will ensure that he/she does not pick up a club when out of sight of the clubhouse.. if you are caught cheating, they will remove you! If your spouse wishes to walk alongside you, then most course will allow this, but please ask the starter to ensure that he is aware of the situation. You will pay for the golf when you accept the tee times and dates given on the quote. If you are playing more than 6 weeks in the future, and the booking is over 750 euros, then you are allowed to pay a 25% deposit, with the balance 6 weeks prior to play. The deposit will ensure that the golf ( and/or Hotel) is reserved and held pending the final payment. If you cancel, prior to the balance payment, please see Cancellations above. If your booking is under 750 euros, and or within the 6 week period, than full payment is required to book the golf. The vouchers will be sent to you when the final or full payment is made, and only when the courses have confirmed the golf. The vouchers are sent to you by email, and after the full payment is made. If you cannot open the vouchers ( we send PDF and .doc files), then let us know and we can fax them, in the worst case..post them via snail mail! The vouchers should be printed up at home and brought with you to present at the courses, If you do not have the voucher, they may not let you play, but usually they will call us and we fax through a copy...but not at 7.30 am!!!! The courses have the booking confirmed at the time and for the number that we request for you. If you take extra players 'on spec' then you are on your own as to availability and rates unless you call us first to try and fix this for you. We confirm all golf with the courses, however, they retain the right to re-schedule players as they wish on the day. This very rarely happens, but if you book well in advance, they may suddenly take a competition or group, and re schedule all the golf already booked. This is out of our control, but luckily, uncommon. When it does happen, we usually have several months notice to re book your golf. Once you accept the quote, and pay the balance or deposit, there are no extras to pay, as the quote shows all the fees and charges. There is only a credit/debit card fee of 2.5%. IMPORTANT We do not accept personal cheques ( either in euros or sterling) Exceptionally,if we do, there is a 2.5% clearance fee on these. We have no hidden extra taxes or fees on the golf or the packages. If there are later alterations or changes by you , all additional fees and charges will be advised as the changes proceed. We try and be as 'transparent' and moral as possible with all our fees and terms. In the rare case that we have to alter the booking due to changes beyond our control, and any extra changes or fees are unnacceptable to you, we will make a full refund of all monies held, which will always be the absolute and full limit of our liability to you and your party. Hotel ( Twin share b&b), as quoted to you. Golf at the listed courses. Car Hire if requested and quoted. Breakfast will usually be continental , a full 'English' may be available for a fee. No other drinks or food are included unless specifically mentioned in your quote. All rooms are twin single beds unless otherwise requested,and land view, not sea view. The golf packages for Vilamoura have several different mixes of their 5 courses..see rates...and do not include any transfers, or buggies, unless advised ( eg Victoria, Faldo and Oconnor), just golf. These packages are not flexible, and they will not allow course substitutions. Each package must be for a single player..you cannot mix and match players in one package. 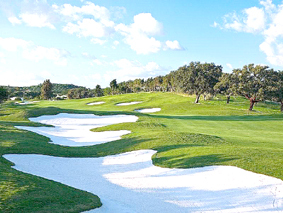 The Algarve courses are running very full over the 2010/11 peak seasons, and some groups have already booked a year in advance and more, to get the times they want. The Old course is full months in advance, Victoria is getting there, and the Algarve is full of golfers. Off peak things are often easier, but if you have a larger group...book early. We recommend that you book your golf in advance if you want anything close to reasonable times, but if you like playing in the dark, or getting up at 6 am.. feel free! If you have a society or large group, then you really must book at least 6-8 moths in advance...even if the flights are not out yet.. book the golf.. we can always cancel it or 'mould' it to fit the flights later! We rent our PLATINUM cars through AUTO JARDIM, who are the largest car hire firm in Portugal by far. We have worked with them for 25 years.. since they had 12 minis , and can confirm that they are the most reliable and reputable firm. We offer a full damage waiver in our rates, so there is NO liability whatsoever on your part. This is usually paid extra per day, on other companies, so watch other prices carefully when comparison shopping! Theres is an almost 'No quibble' system...unless you are drunk, drugged, medically insane, or any mixture of the above!.. (The chance would be a fine thing!). You will collect the car from , and return it to, the depot which is about 2 kms up the road from the airport, and they will bring you to the airport in their own shuttle, which runs every 5 mins or so. You will only pay what is on the quote for the car, and there is a petrol deposit of approx 100 euros to pay on collection of the car. This is refunded to you 100% on return of the car full of petrol/deisel, either in cash or your c.card slip returned. You have the option to pay for :- extra driver 20 euros, Spanish border Insurance, 45 euros, or baby seats etc etc should these be needed. They will offer you the 'personal accident' insurance at the counter.. DONT take this 'extra' as you are covered by holiday insurance for this if you have it. NB rental cars during 2010 an 2011 have been overbooked for Late July and all of August....so book early! The Hotels run an independent shuttle bus to the Vilamoura and Vilasol Courses. There are also free transfers from Vilamoura to the New Faldo and O'connor courses. You must ask reception the day before, to book you transfers to the courses, and they will give you a time for pick up. If we have arranged golf transfers for you, then our taxi man will pick you up about 60 mins prior to golf time, or longer if the course is at the far end of the coast... If he is not there within 15 mins of the pick up time, please call us and we will sort it out. There is also a number on the taxi voucher, so you could call the taxi office direct, they do speak english. AIRPORT TRANSFERS ARE BOOKED 3 HOURS PRIOR TO YOUR DEPARTURE FLIGHT TIME. IT IS YOUR RESPONSABILITY TO RECONFIRM FLIGHTS AND TIMES, AND ADVISE US OF THIS IF THERE ARE ANY CHANGES. On all transfers, please confirm the collection time for your return, as you may be liable for excess waiting time if delayed by slow golf , slow service at the bar (!) etc.. we suggest that you take the drivers mobile number.. and keep him aware of the time you would like to return. We Have to pay a fee to the credit card operators of 2.5% whenever we process a card, even foreign debit cards. As we work on low margins we are forced to pass this onto you..sorry! Switch and maestro cards are not accepted by international systems as yet. Amex and Diners/JCB cards charge 5% and upwards on their transactions. We are unable to take them due to their high charges. We accept any card with visa or mastercard. Visa electron is not yet available. Who are You and What Security do I have? Alistair MacGregor, our managing partner and owner, has been in the Algarve since 1964, over 40 years, and has run several business including travel agency, property sales, villa management, and others, some of which he still does. We started the golf agency, due to an obvious demand from our rental clients, and it has virtually taken over our office and time from 2005 onwards. We have a total currently of 4 staff, and book several thousand rounds of golf per year, and are growing every year...I ( Alistair) do the web page as well.. so if it doesn't work let me know, I answer the phones when busy, and try and get a game of golf in when I can.. which this year is about one a month!..the up side that is my handicap is at the max...the downside is that my game is at the min...and deserves the 28 I am playing off! You can always call and ask to speak to me directly if there is any problem. We have a fully licensed Portuguese registered company with a European Tax number (that you can look up) PT 501 407 381. We are listed on the Portuguese tax magazine every year as to 'presenting' our annual accounts...and the best way to check up on us is to call any of the Algarve courses at random, and ask who we are..as we speak to them all, several times a day, I don't think that there is anyone who doesn't know us!